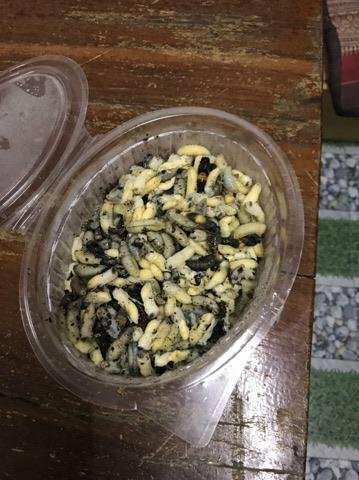 Maria’s neighbours enjoyed the cooked wasp larvae. 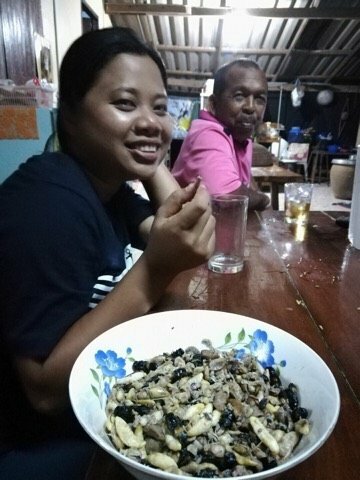 Maria’s neighbours enjoying the cooked wasp larvae. 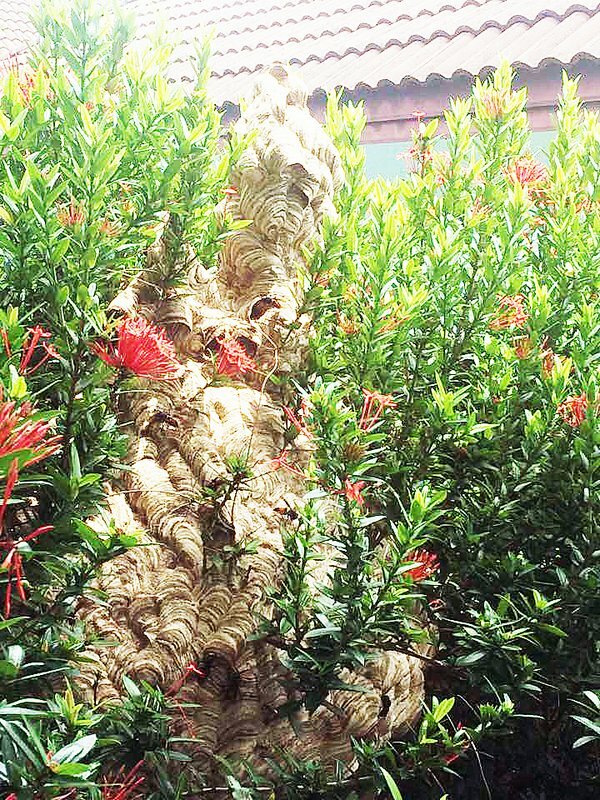 Recently however, reader Maria Cotter came home from holiday to discover something rather different: the emergence of a strange structure among her ixora bushes. Have a look at her photograph. The design is rather beautiful, but hardly what you want in your garden. Why? 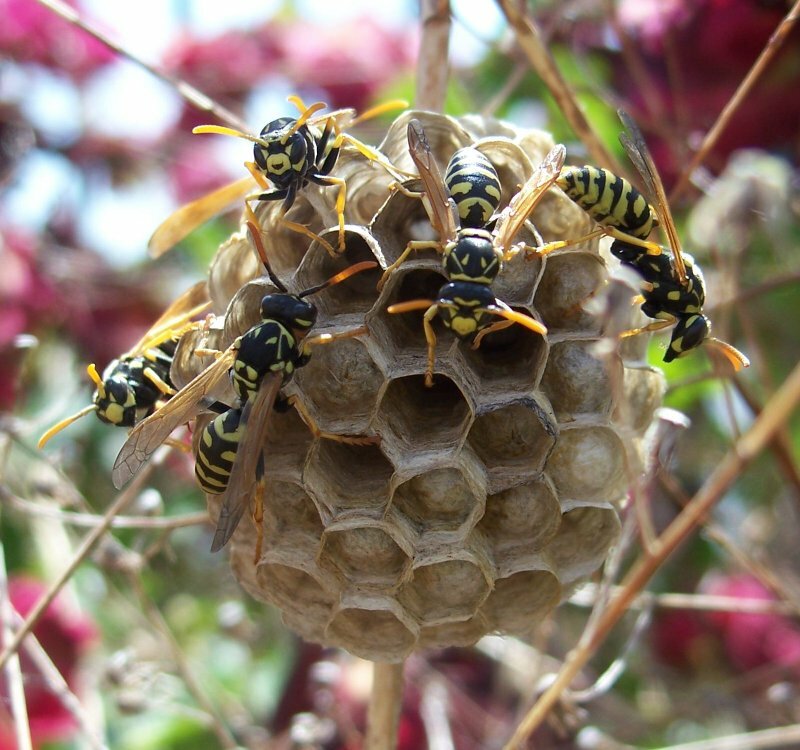 It is the nest of the paper wasp or Polistes dominula, a species of social insect that, like most bees and wasps, constructs its dwelling by chewing off dead fibres from wood and plant stems. These it mixes with saliva to form a papery compound with which to construct their nests. Normally the founding queen will choose to start things off in a sheltered spot – under eaves or rafters, in a tree hole or along a branch. Selecting a low-growing shrub is distinctly unusual. But it leaves Maria with a problem. Not only is this nest waterproof and ant-proof, it is now home to lots of rather large insects who will sting anything or anyone that directly threatens their fortress – now occupied by wasp larvae and workers. When I was a boy we regularly found wasp nests the size and shape of footballs in cavities in the garden soil. We disposed of them by plugging the tiny entrance with a lump of poison such as cyanide. That is not an option here. Maria has three choices. She can either call her local pest control agency or, if that is not feasible, she can handle the problem herself by buying a powerful pesticide and spraying the nest at night when the wasps are relatively inactive. She will need to cover up well, and wear protective clothing. And the treatment will work more effectively if she can locate and douse the main entrance. 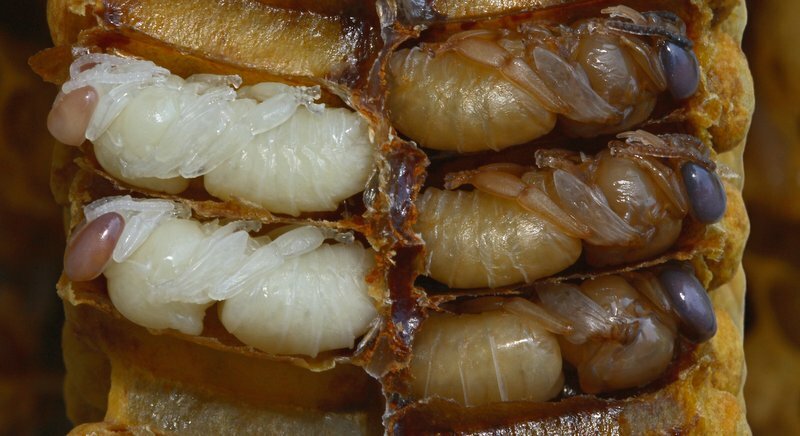 Of course you could leave well alone and let sleeping dogs lie: the paper wasp will not attack unless provoked, and it is actually useful in the garden both as a pollinator, and as a predator of pests such as grubs and caterpillars. Thirdly, inaction, which would be my personal choice. 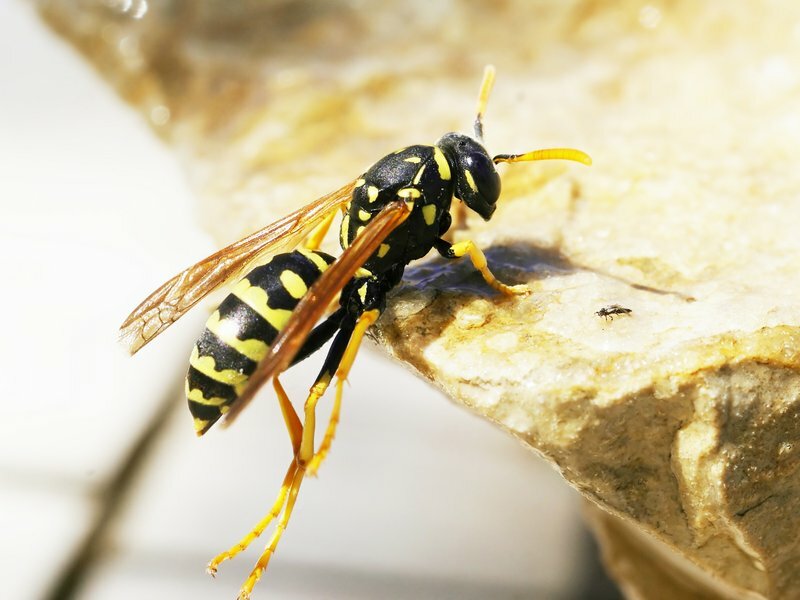 Wasps have a bad reputation but it is less deserved than that of the hornet. The largest of the social wasps, hornets can reach two inches in length. The commonest variety here in Phuket is Vespa orientalis, which has a distinctive broad yellow band across its abdomen. And they are much more aggressive than wasps. If you make the mistake of disturbing a nest, the whole colony can attack and sting in defence by the production of pheromones. Such attacks can be lethal. Imagine 700 hornets coming at you. Every year there are cases in Thailand of people dying from multiple stings, people who made the mistake of trying to remove nests from their sites in hollow trees. The giant hornet (Vespa mandarinia), fortunately a rarity here, is one of the most venomous of insects. Every year, it claims the lives of numerous victims in the mountains of China and Japan. And hornets are not just a menace to humans. 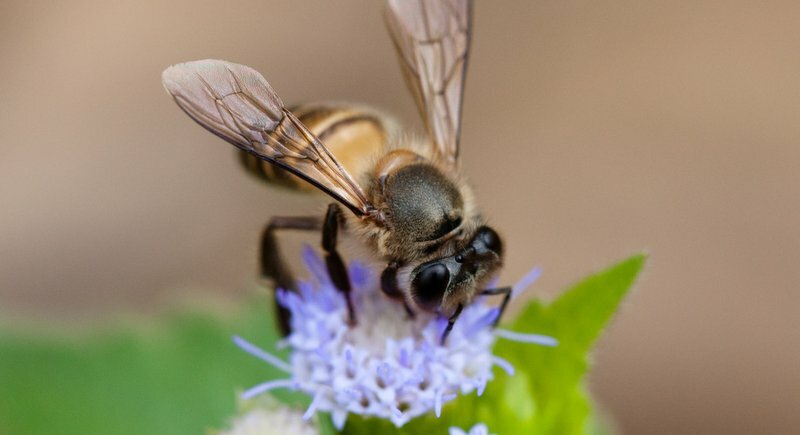 More importantly, they are one of the main reasons why honey bees are in serious decline, for they frequently attack hives to steal honey and pollen. On the other hand, bees, as we should all be aware, are the most valuable insects on the planet. I was delighted when a colony of Asian honey bees (Apis cerana) decided to build their pendulous oval nest on a branch of my mango tree. They are dainty creatures with yellowish abdomens and rarely sting, since the act of injecting their barb causes them to die. Like all varieties of honey bee, they are under threat. If a man walks into your local bar with a bucket full of honeycomb, don’t be tempted to buy. Several wild bee’s nests, whole colonies of honey bees, have been sacrificed in order to sell a few bottles of raw honey. Get your honey from commercial sources, from apiaries. Look for labels that say “organic” or better “produced without insecticides”. But even hives are in decline as the beleaguered bee faces an unprecedented number of enemies – not just marauding man, but robber wasps and hornets, parasitic red mites and zombie flies, something still not fully understood called colony collapse syndrome, and most important of all, pesticides and herbicides. Our planet depends for its very survival on pollinating insects – of which the bee is by far the most important. Unlike carnivorous wasps and hornets, bees obtain all their nutritional requirements from a flowery combination of pollen (rich in protein) and nectar (which they convert into honey). In order to obtain these goodies, they accidentally pollinate most of our crops and flowers in our gardens. Without this fertilization, these crops will not fruit, our blooms will fail to produce seeds. Industrious bees always keep their side of the bargain. It has been calculated that one colony may fly 90,000 miles, equivalent to three orbits of the earth, in order to collect one kilogram of honey. And though bees don’t know it, they not only produce the most complete natural food known to man, they literally keep our planet going. And have been doing so, here in Thailand, for millions of years. The good news is that we, as gardeners, are doing our bit to help. Patrick Campbell has been writing for ten years about gardening in Phuket and allied topics. If you have horticultural or environmental concerns, please contact him at drpaccampbelll@gmail.com. Many of his earlier creative and academic publications can be found at his blog Green Galoshes.